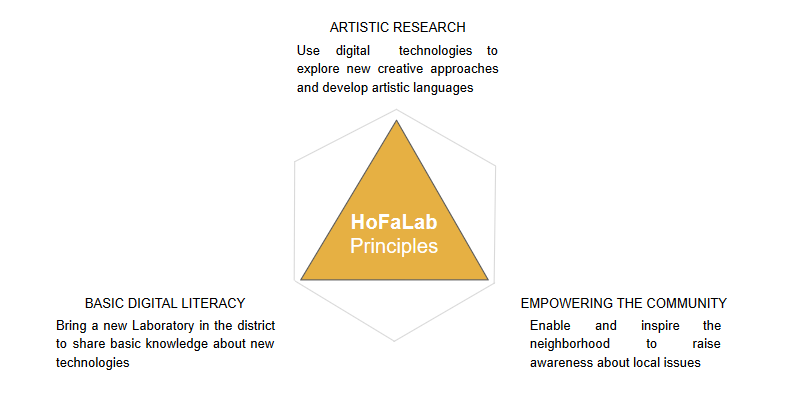 HoFaLab is your digital workshop to learn and make things yourself in your neighborhood. HoFaLab stands for “Honigfabrik Laboratory”. It is a combination of the words “Honigfabrik” (often shortened by locals as Hofa) and “Fab Lab”. HoFaLab is open to (Media-)Artists, Tinkerers and anyone interested. HoFaLab is since 2019, as part of the anstiftung/Offene Werkstatt, a place for creative production & artistic research. In everyday life, we want to learn to set technology in a self-determined and responsible way. We are the middle point for people with and without expertise. We focus on the shared experience of the practice. For that purpose, we promote through workshops the appropriation of new technology and production in the neighborhood. Use those technologies to explore new creative approaches and develop artistic languages. Bring a new laboratory in the district to share basic knowledge about digital technologies. Enable and inspire the neighborhood in order to raise awareness about local issues. HoFaLab is located in Hamburg, Germany. More specifically in the cultural center Honigfabrik in the district of Wilhelmsburg. Hofa has been THE cultural center in Wilhelmsburg since the 1970s. Everyone can get involved and join in. Thereto, you can visit one of the countless open workshops – make use of the car workshop, the wood workshop, the metal workshop or one of the art studios. The diversity of the Honigfabrik has no borders, making it an important meeting place in the district. The Hofa is self-determined, artistic, artisanal and social. The HoFaLab is the logical evolution of Hofa for the future.